I had no idea that NFL superstar Arian Foster was exploring veganism. Earlier this year the Houston Texan running back adopted a plant-based, “mostly” animal free diet. In an interview Foster stated that he’s “dabbling back and forth.” If he wants something (i.e. meat) he eats it, but he prefers healthier plant-based foods. I hate to quote American Idol but I love when people take something and “make it their own.” Although some would argue that there is no grey area when it comes to veganism, I say do what works for you. I’m sure having a 95% plant-based diet is better than nothing! Best of Luck Arian….on the field and in the kitchen. 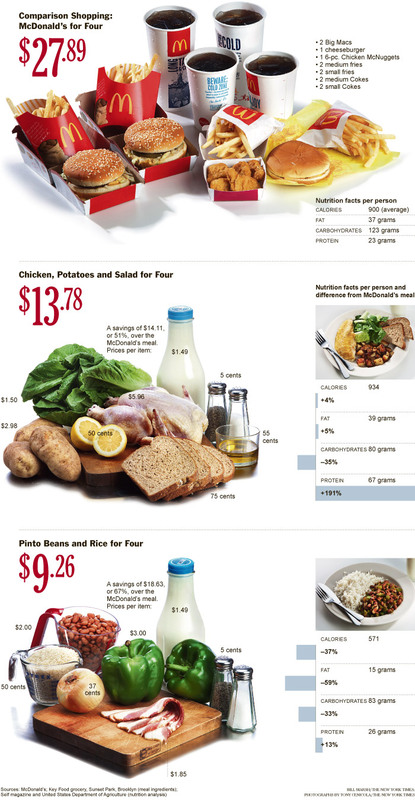 Last year, reporters from The New York Times conducted a test to see how cheaply a family of four could eat. They paid $28 for dinner for four at McDonald’s, $14 for a dinner of chicken, potatoes and a salad and just $9 for a mostly vegetarian dinner of pinto beans, rice, bacon and various seasonings. And that $9 meal also had the fewest calories of the three. This would have been cheaper had they made this a truly meatless meal and eliminated the bacon. How difficult would it be to marry someone who doesn’t share the same eating lifestyle? How higher incomes and more education didn’t increase “veganism”. What thoughts come to mind when you see this graphic?